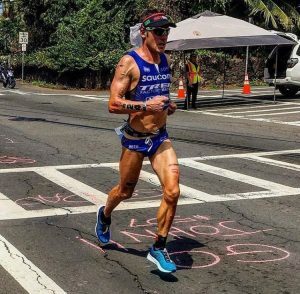 As much as I would love the Ironman World Championship to rotate locations like every other sport and the Ironman 70.3 World Championship, it is not going to happen any time soon. I need to adapt to the conditions in Kona or choose a different major objective to rotate my season around. Pic- Ironman World Championships 2017. Pic- Dan Brown. One of the major reasons I think SOS works so well for me is that the dominant source of sodium in SOS is sodium chloride. Sodium chloride is how we would naturally consume salt in our diets and because of this the human brain has a terrific way of telling us when we need it and when we don’t. It tastes really good when we are salt depleted, while the chloride component is not as tasty when you don’t need salt. For example, on a Byron Bay humid summer day, I’ll drink 3-4 sachets of SOS per bottle for my hard sessions and my taste buds are dancing with pleasure. At rest however, when my sweat is negligible, I find that if I mix 3-4 sachets per bottle then the chloride component of SOS makes the taste far too strong and my brain tells me to back it off so I’ll only do one sachet. Given how essential salt is to human function it is really not surprising that we evolved to be pretty damn clever at balancing out how much salt to ingest through a taste feedback loop. 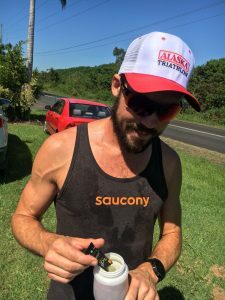 Where many other sports drink formulas fall short is they use artificial sweeteners and/or lots of sugar and less natural, manufactured forms of salt which inhibits our normal way of regulating salt through taste. Another major SOS drawcard is that I don’t want to be consuming lots of sugar unless I really need it to fuel very high intensity training and racing. SOS has enough glucose to facilitate fluid absorption in the small bowl via the sodium : glucose co-transport system but not enough to lead to significant insulin spikes and certainly not enough to slow absorption as some leading sports drinks have made their formulas. The sugar content is low enough that with my overly active lifestyle I can drink as much SOS as I like guilt free.